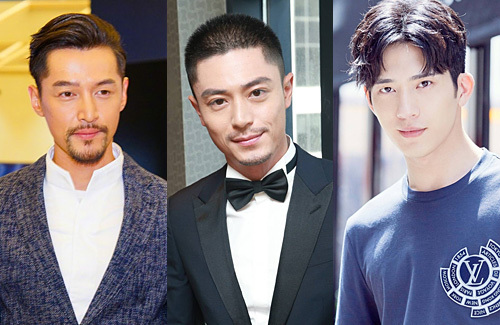 Above: Hu Ge, Wallace Huo, and Jing Boran are among the top-earning actors in China. 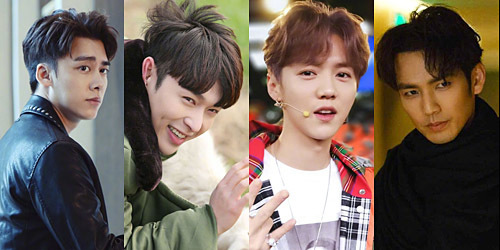 A recent report published a list detailing the Top 100 Highest-Earning Male Artistes of Chinese Television. Not surprisingly, many of the actors were from Mainland China. The top earners, commanding $100 million RMB in filming fee, include Hu Ge (胡歌), Chen Kun (陳坤), and Yang Yang (楊洋). In contrast, the highest-earning female artistes of Chinese television, including Yang Mi (楊冪), Sun Li (孫儷), Fan Bingbing (范冰冰), and Zhang Ziyi (章子怡), average only $80 million RMB in filming fee. Compared to their male counterparts, there seems to still be a slight gender wage gap. Earning $90 million RMB filming fee are Jing Boran (井柏然) and Liu Haoran (劉昊然). Both actors’ earnings were boosted by appearing in top grossing films. Jing Boran is known for his roles in Monster Hunt <捉妖記> and Time Raiders <盗墓笔记>, while 20-year-old Liu Haoran starred in the lucrative Detective Chinatown <唐人街探案> film franchise. Director/ actor Jiang Wen (姜文) also commands the same filming fee. Actors bringing in $80 million RMB include: Wallace Chung (鍾漢良), Li Yifeng (李易峰), Wallace Huo (霍建華), Wu Xiubo (吴秀波), Kenny Lin (林更新), Zhang Yixing (張藝興), Lu Han (鹿晗), Huang Zitao (黃子韜), and Hong Kong singer and actor William Chan (陳偉霆). TFBoys members, Karry Wang (王俊凯), Roy Wang (王源), and Jackson Yee (易烊千玺) are also in this caliber. Actors earning $70 million RMB filming fee are Hans Zhang (張翰) and Luo Jin (罗晋), who are mainstays in Chinese dramas. Sun Honglei (孫紅雷) also commanded the same filming fee. Surprisingly, Huang Xiaoming‘s (黃曉明) filming fee falls short of his wife, Angelababy (楊穎), who earns approximately $80 million RMB filming fee due to her popularity in variety shows. However, the 40-year-old actor still made it to the list with an average earning of $60 million RMB. In the same tier as Huang Xiaoming in terms of earning power are Taiwanese idol stars Vic Chou (周渝民), Ethan Juan (阮經天), Chen Bolin (陳柏霖), and Mark Chao (趙又廷). Earning $40 million RMB filming fee are Nicky Wu (吴奇隆), Ming Dao (明道), and Hu Jun (胡軍). One of the more familiar Hong Kong faces to have made it on the list is Chilam Cheung (張智霖). Although it has been several years since his last Mainland Chinese television project, Chilam has stayed relevant in the Mainland market through the various shows he has been taking part in with his wife, Anita Yuen (袁詠儀). The 46-year-old baby-faced actor made it on the list at $30 million RMB filming fee. In the category are Mike He (鄭元暢) and Qin Hao (秦昊). If you count China, of course. Some may money laundering. Da fawk. Huo Yitian just joined showbiz not too long ago. The fee he commands is outrageous, considering he’s still a relative newbie in the field. I actually think the men’s pay this time around is a little lopsided and unfair. I mean ABB earning more than her hubby, for her [email protected] acting skills? Some of the women’s fees are understandable. FBB and Yang Mi both have their own production houses, so they can negotiate their own pay. Surprised that Zhang Liying isn’t on the list, though. Sun Li & Zhang Ziyi are established and veterans of both TV and films; they deserve their pay. @coralie lol what beef me is Lu Han’s fee! He’s the worst actor ever, and his feature is terrible unless the right makeup, lightning, clothes, set, etc. so he’s like a product of good production, like MV, not drama! Yet his fee is as high as Wallace Hou??? Like that dude needs to get real, but hey, keep pushing his fee up, maybe then people can’t afford him and so he can stop being in drama! That dude is an eyesore! i can never understand why female artists earn less than male entertainers esp when they star in the same show. can there really be that many shows that they can do w/o a female lead thus causing the rift in pay? @m0m0 many girls will watch the show for their “prince” regardless of how bad it is, or who he pairs with, but not many boys do the same for their fav actress, and not many girls will watch for their fav actress if the guy she pairs with doesn’t catch their eyes. So all in all, the guy is more important lol. @littlefish Yeah, females are more into idols. Males generally do not give a damn. The probably prefer curves over acting. Lol. Girls are crazy over Lu Han, Kris Wu or in fact all the former TF boys. Understandable. Many become famous actors after becoming pop idols. Pretty common in Asia entertainment. Huang XM has his own studio. So he can choose to pay himself more or less if it is his own production. Same with Harwick, Yang Mi, Fan BB. Where is Vicky Zhao? Never understand the appeal of Lu Han (he’s like Angelababy, no acting skills), Kenny Lin, Jackson Yee, Huang Zitao and William Chan. And while I like Yang Yang, don’t think he deserves that high amount of fees (his acting is mediocre), together with Hu Ge and Chen Kun. Oh no, I just think Yang Yang does not deserve to be earning that much and to be found in the same category as Hu Ge and Chen Kun who are obviously better actors than him. Hu Ge has acted well in some dramas, not all but if he is one of the highest paid TV actor, I can still see the reason. As for Chen Kun, can’t say much since I don’t really watch all of his productions but the one or two that I saw, he didn’t become my favorite actor lol but I didn’t think he was bad. @bearbear I see, thank you for clarifying! I haven’t seen any yang yang’s productions as they are kinda all low score apart from the one famous one, love o2o or something like that, but I don’t watch that one either as modern cdrama isn’t my thing (too long than it needs to be). @littlefish I thank you for being nice to give me the chance to rephrase what I really mean. I didn’t realize what I wrote gave a different interpretation until you pointed it (and I reread it after that). Watched Love O2O very recently, I was reluctant at first since the book was really enjoyable and adaptions usually do not turn up well (Scarlet Heart was one of the rare exceptions). He’s good looking in there since he is a good looking young man but that’s all. I dropped the drama 3/4 through it. It’s a popular drama but think I will just stick to the novel. Once Upon a Time movie was a waste of time from props, story to acting. Thought his acting was actually promising in his first drama though most audiences did not think too highly of that whole drama. His only job in his later productions, at least those that I managed to watch, seem to focus on looking suave. @littlefish I love seeing good looking actors as well, probably that is why I still like Yang Yang, hahaha. Sometimes an average looking actor who oozes so much charisma in his role or because of his role that he suddenly becomes attractive as well. Better keep it low key if he still wants to be earning big bucks, hahaha.